SOLD New Map of that Portion of North America Exhibiting the United States and Territories, the Canadas.. Size: 58 inches height x 60 wide. Full title: ''New Map of that Portion of North America Exhibiting the United States and Territories, the Canadas, New Brunswick, Nova Scotia and Mexico, also Central America, and the West India Islands Compiled From The Most Recent Surveys, And Authentic Sources - Baltimore, MD - Jacob Monk - 1853". Made in Baltimore, Maryland. 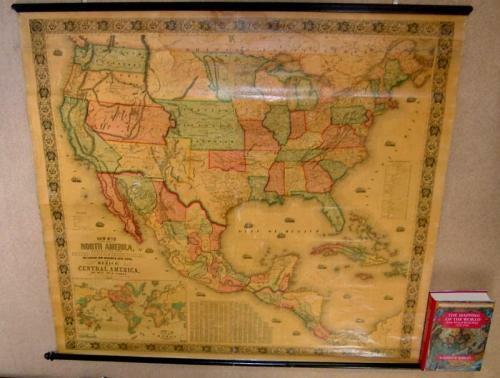 A very large lithograph wall map of the United States, with an inset world map, on the original wooden rollers. A scroll format that is canvass backed and varnished. The map covers North America with the Canadian border and the Great Lakes, Panama and the entire West Indies. There is much detail of the westward development of the United States: several established states, trails, and major routes are marked. California is largely shown as a 'Gold Region', and many Indian tribes are indicated with comments about recent historical events. The inset world map to the lower left shows the major trade routes and includes a table of inland and other journey lengths. There is also a large list that contains the names of the counties and county towns of the United States. The map is decorated with steam and sailing ships scattered througout the seas. The entire map is bordered with a intricate and beautiful floral border. The map is in very good condition and the rollers have been securely attached so that the map hangs well. The map has a small amount of minor stains or whiting and a regular even toning. Overall these small imperfections do not distract from the effect of this stunning map and should be considered 'antiquarian'. Reference: Wheat page 794 (for this 1853 issue): "... a large and showy wall map." (Book ID 34957).